This is for any student of GCSE Biology who wants to challenge their learning, whether its to prove they know it all or to help them know it all! 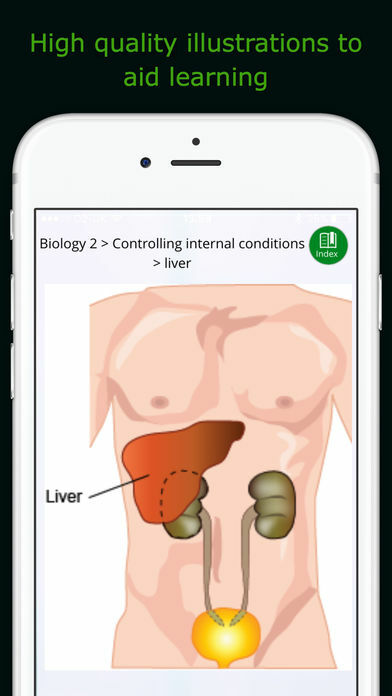 In this app you’ll find all the key terms in the syllabus with their meanings along with video clips to help explain those tricky concepts. Then put yourself to the test – find out what you know and prove you’ve mastered every topic. 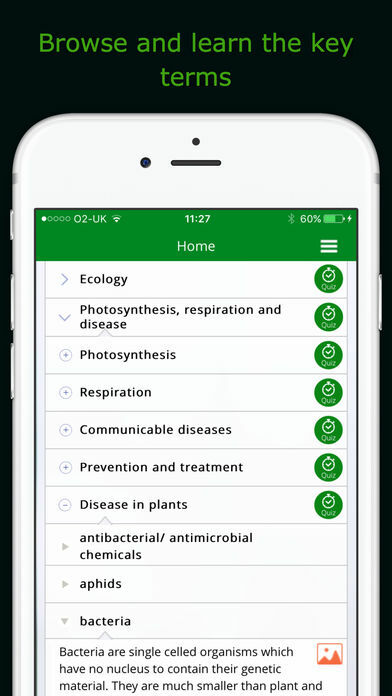 ‘ixplain’ has produced an app dedicated to GCSE level Biology which focuses on seven main themes; Cells and organisation, Coordination and control, Ecology, Photosynthesis, respiration and disease, Reproduction and genetics, Working scientifically and mathematically, and Careers ideas and skills. The ‘Home’ menu allows you access to all the content in a drop-down format. 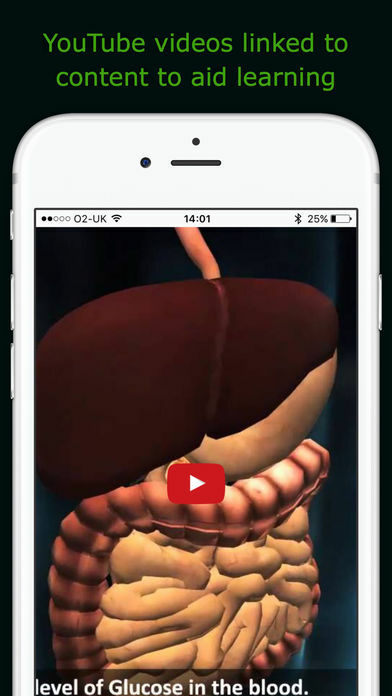 You can also flick through thumbnail versions of the images and the video clips. Each of the seven major sections are further split up into smaller topics. Once you select a topic you are then provided with a list of the key terms used in the topic organised alphabetically. When you tap on a key term the text appears giving the reader the definition of the word or phrase. Most of these terms also include a link to view an image, and in some cases a video or external webpage link. Along with the curriculum content ‘ixplain’ contains additional information on careers in Biology. 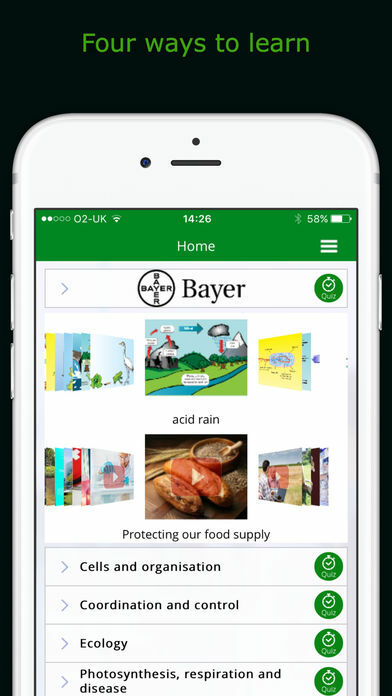 The app is supported by the Royal Society of Biology and a Life Science company called Bayer. There is a vast selection of pictures and images that are provided to support the main text of each key term. The entire library of images can be accessed from the ‘Home’ menu but they are best understood along side the definition they are illustrating. The video library is linked to YouTube videos and therefore can only be viewed when your device has internet connection. The clips are not produced by the app developer and are more akin to a YouTube playlist patched together from other outlets. This means the videos vary in educational approach and quality. However, in general they are simple and effective in providing an alternative medium for learning. 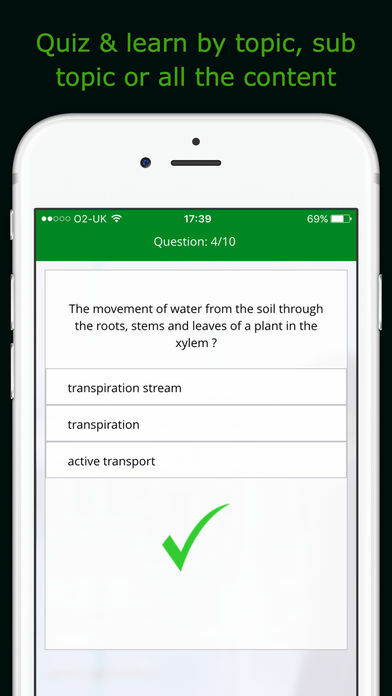 The most impressive feature of the app is the combination of the ‘Quiz’, ‘Stats’ and ‘To Learn’ options. They all work together to illustrate clearly a student’s attainment and progress and at the same time providing target areas for improvement. The quiz is in a multiple choice format that challenges you with thirty timed questions based on each topic. You can also attempt a general quiz that mixes together all the topics into fifty questions randomly selected from the other quizzes. To view your progress through each of the mini assessments you can tap on ‘Stats’ where you will be shown your percentages for each topic. It is possible to follow-up on any of the incorrectly answered questions by tapping on ‘To Learn’. The app keeps a record of what key terms you still need to learn with easy access to their definitions. Navigating through the main features of the app is simple, however it doesn’t lend itself too well when you select to view an image. It can be a bit frustrating to constantly have to flick back to the ‘Home’ section and then swipe down to find where you were previous reading after viewing an image. Closing a video and getting back again to the app isn’t too straight-forward either but these are only minor issues overall. Watch & Learn via the Youtube videos linked to the content. Enjoy ixplain and please tell your friends about it. We also have ixplain apps for GCSE Maths, GCSE Physics, GCSE Chemistry, GCSE Additional Science, GCSE Science and GCSE Computing along with Apps supporting F1inSchools and the BLOODHOUND SSC project. Written by education expert Ann Fullick and supported by award winning careers writer Liz Reece & skills expert Gareth Lewis. We work hard to ensure ixplain content is totally accurate. However, if you find anything you think is incorrect, or you have ideas about how we can improve the app for you please tweet us via the Twitter link in the app. Can improve their understanding and GCSE results by providing the building blocks of knowledge via the key terms. Please see below for the full content covered along with how the stats section works along with the technical requirements. Topic quizzes: questions are presented randomly. The % score is shown at the end of the quiz - a button takes you to the summary of the questions you got right or wrong. You can go back to the original questions or facts to improve your understanding. 3 shows the % of the content you have answered correctly.